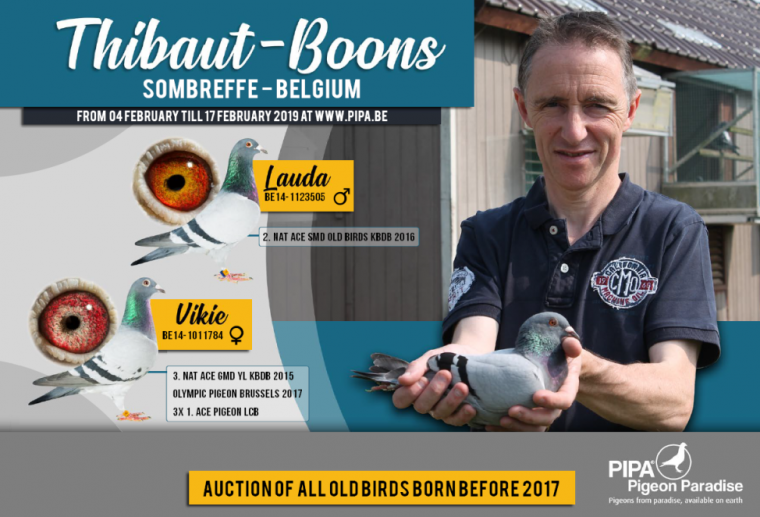 Super class fancier Jean-Marc Thibaut Boons is selling his entire old birds' collection from 2016 and older in a fantastic auction. This comprises all of his best racing and breeding birds of today, along with a selection of youngsters, bred from his best birds. The renowned Audrey dynasty will inevitably play a key role in this event. We have a catalogue available for those that cannot wait, and for those that enjoy browsing through the catalogue in book form. You can order the catalogue (in English) using our online order form. The catalogue costs 10 euro, shipment included. If you choose to pay through bank transfer, the bank details will be provided right after placing your order. Please remember to include the message 'Thibaut-Boons catalogue' with your payment. (If you order the Thibaut-Boons catalogue, you will also receive a Joël Verschoot catalogue). Keek in mind that all fanciers that have already purchased one or more pigeons on PIPA will automatically receive a copy at home! Alternatively, you can also download a digital copy of the Thibaut-Boons catalogue here.